It is often said that architecture is music frozen in time. But when a building reverberates with the sounds of voices, footfalls of people walking or merely day-to-day activities in such a way that it hinders work performance or impacts on the well-being of employees working in it, serious steps need to be taken to dial down the noise levels. Noise is created when sound energy is transmitted either by impact or by air. In a public or work space where impact sound is often created as a result of footsteps, slamming of doors or dragging of furniture. It can easily be transmitted through the entire building structure and impact all the employees working in a building or sharing a workspace. Other common sources of noise include traffic, weather, plumbing, duct-borne noise or noise entering the building via open windows. “Noise can have an extremely detrimental effect in the workplace and can even significantly impact an individual’s well-being and hinder work performance,” says Tandy Coleman, CEO of Polyflor SA, specialists in vinyl flooring and wall protection solutions. “For this reason, acoustics, sound levels and sound insulation that effectively reduced the noise levels within new and refurbished commercial interiors, are increasingly becoming a primary area of focus for builders, contractors and architects,” she explains. Sound levels and sound insulation values are expressed in decibels (dB). In recent years, more and more countries have begun introducing new legislation aimed at addressing resistance to the passage of sound. In the UK for example, building regulations are in place that stipulate that a suitable floor covering should have a weighted reduction in impact sound pressure level of not less that 17dB when measured in accordance with EN ISO 140-8 and calculated in accordance with EN ISO 717-2. Fortunately, the negative impact sound can greatly be reduced by professional acoustic planning at the outset of a project and with the expert assistance of a specialist acoustician. Aspects such as acoustic ceiling and wall panels, fabrics, textiles, plants and mindful space planning can all contribute towards reducing noise. “We have seen a surge in demand by architects specifying acoustic floor coverings for use in their commercial buildings owing to the fact that they are able to greatly aid in creating a peaceful, quieter working environment. 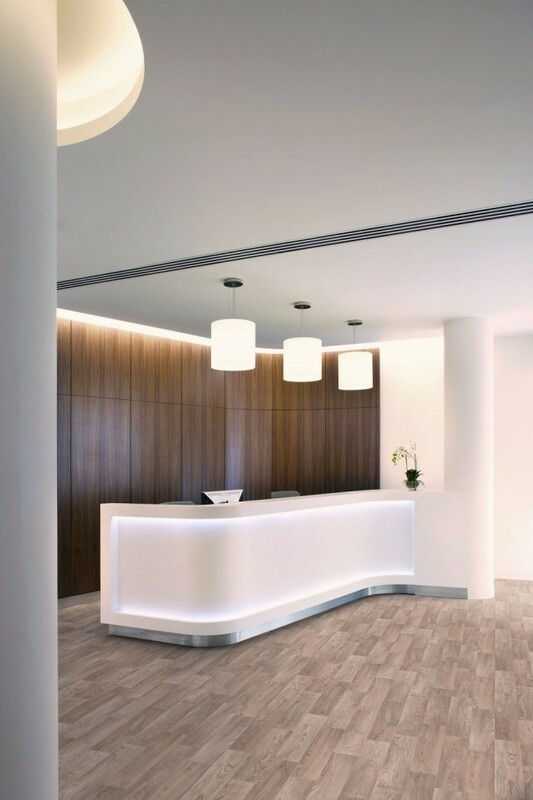 By selecting and correctly installing reputable acoustic floor coverings, they are able to meet the industry standards of a minimum reduction level of at least 17dB, and in some cases even exceed reduction levels of 19dB,” Tandy explains. Polyflor offers a number of acoustic options within its heterogeneous flooring collection. These allow designers to combine aesthetically pleasing designs with robust functionality in a variety of different spaces such as: entrance and reception areas, lobbies, corridors and hallways, meeting rooms, hotel rooms, auditoriums, classrooms and lecture halls, libraries and high-density residential developments. “Acoustic flooring is an excellent choice for large spaces, as it reduces echoes and creates ambience in a room. They are able to reduce impact sound at source as well as provide the additional benefits of aesthetics, performance, hygiene and durability,” Tandy explains. Available in a wide variety of different colours, designs and finishes, Polyflor’s three main acoustic flooring ranges are Silentflor PUR, Acoustix Forest Fx PUR, Designatex PUR and Secura PUR. Customers are spoilt for choice when it comes to colours and designs options – ranging from wood effect (Aged Oak, Autumn Rain, Blond Oak, Bronzed Pine, Burnt Orange, Classic Limed Ash) to concrete (Light Grey Concrete, Light Industrial Concrete) to stone finishes (Onyx, Zinc etc). “These floors expertly meet the demands of today’s commercial interiors whilst offering unique sound reduction capabilities, aesthetics and a hassle-free maintenance for years to come,” Tandy concludes.